Thanksgiving-themed posts and recipes are getting lots of traffic here in Glover Gardens this week, so I thought I’d make it easy and round a few of them up. It’s really all about the sides at the Thanksgiving table, right? I mean, when else do you get the harvest bounty of all those gorgeous fall vegetables all dressed up in their holiday best? Our family’s approach to corn is here: Best Creamed Corn Ever – Handed-Down and Upgraded Scratch Recipe from My Dad and Grandmother. 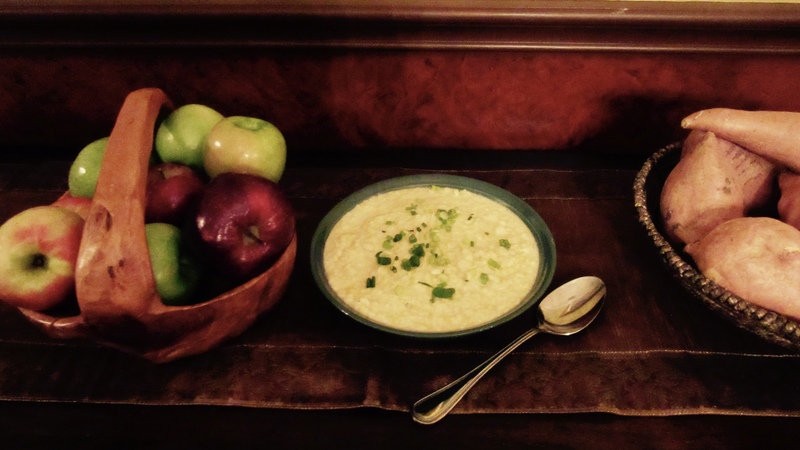 This creamed corn is a rich, creamy dish that makes you nostalgic for the old days when life was simpler, people were kinder and you could borrow an egg from your neighbor, even if you never experienced any “old days” in that way. 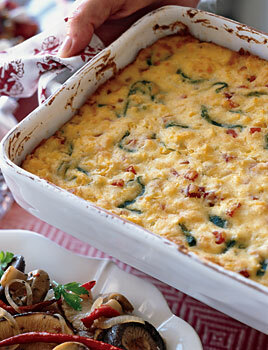 Another favorite with corn takes a spicy, southwestern turn: Food Magazine Treasures: Serrano Ham and Corn Pudding. The Grill-Meister is a reluctant vegetable-eater, but even he will dig into these Brussels sprouts (it’s the Bacon Effect): Roasted Brussels Sprouts with Cranberries, Bacon and Bacon-Jalapeño Jam. 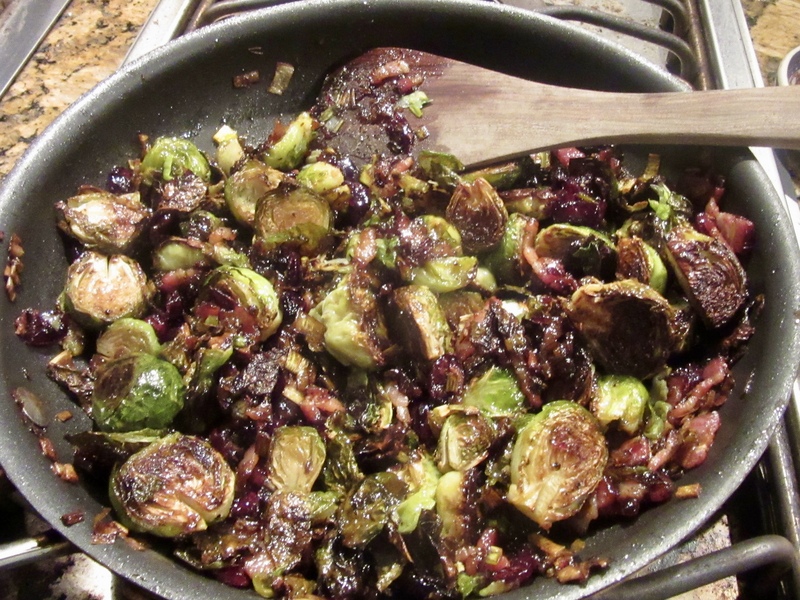 Almost blackened, these sprouts are spicy-sweet-tart-crunchy-soft yumminess and perfect for the holiday table. 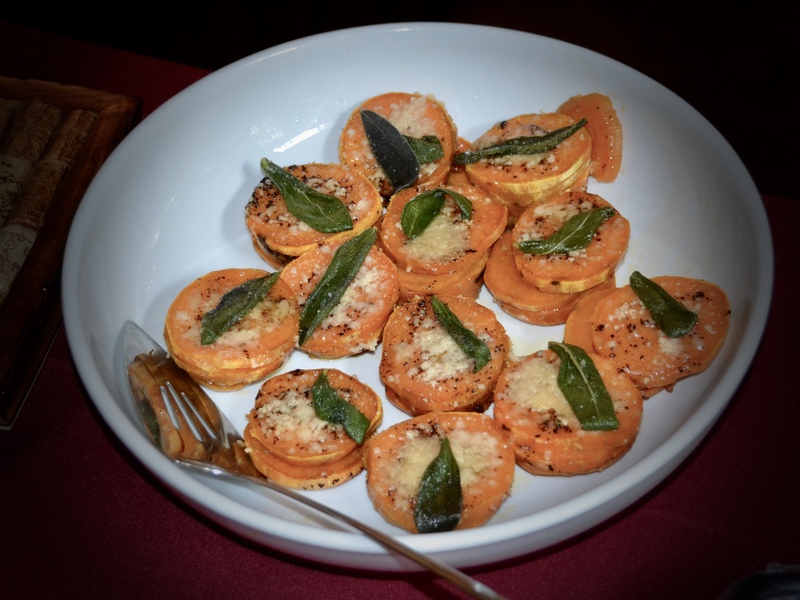 A new addition to the repertoire is Sweet Potato Stacks in Browned Butter with Sage . My grandmother “Mema” fed us in classic grandmotherly style: something was always just out of the oven, just for you. Her legendary yeast roll recipe was a star at every Thanksgiving, and is captured in We Call Them “Mema Rolls,” She Called Them “Refrigerator Rolls” – Call My Grandmother’s Delicious Yeast Rolls Anything You Want, but Don’t Call Me Late for Dinner if You’re Serving Them. We like the spatchcock method for turkey these days. Spatchcocked turkey is everything you want in a turkey: moist on the inside, with crispy, savory, mahogany skin on the outside. 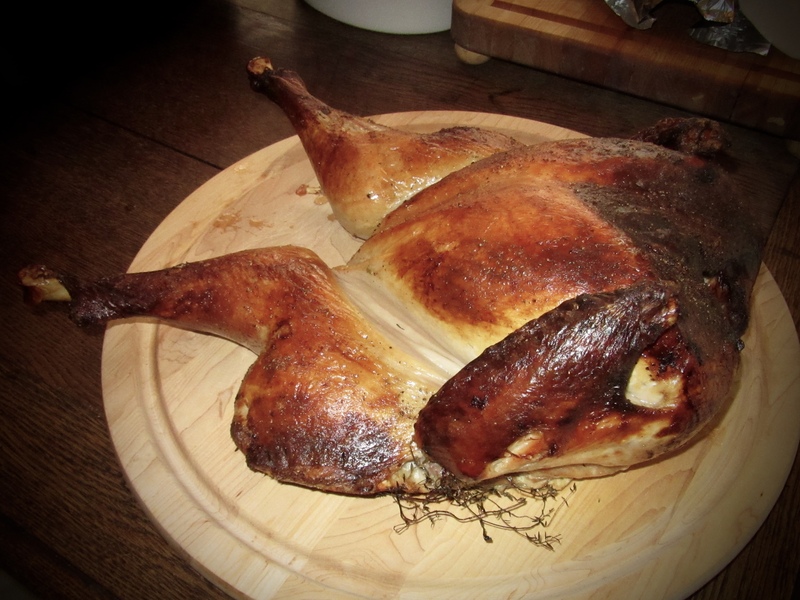 Check out our experiences with it here: Spatchcocked Turkey. Say What? 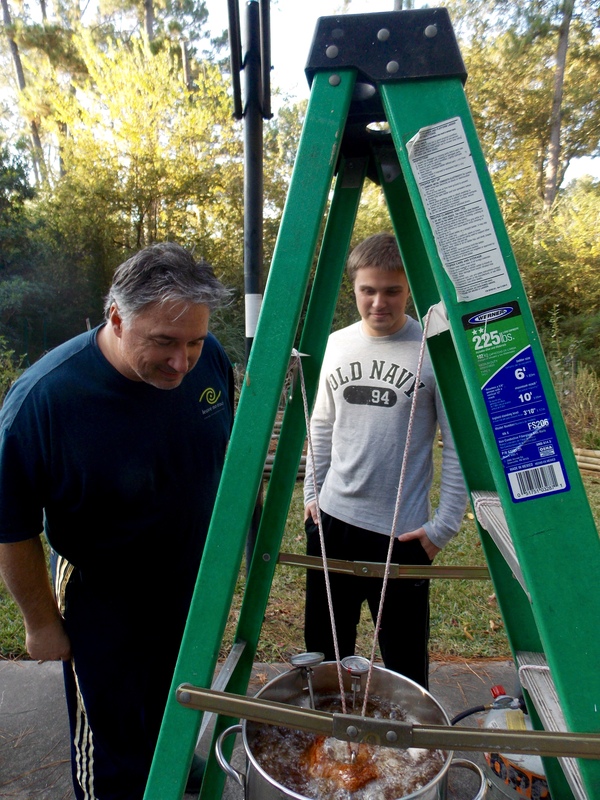 We also recommend Alton Brown’s Deep Fried Turkey, if you are ready for a turkey adventure. 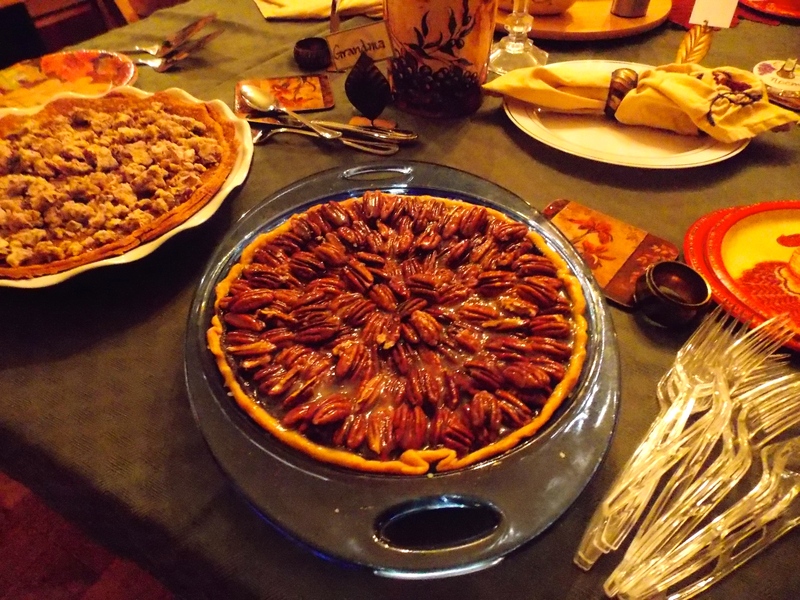 This pie is a wonderful mix of textures – the crunch of the toasted pecans with their caramel glaze and sea salt garnish balances perfectly with the soft, fudge-like filling. Find it here at Food Magazine Treasures: Salted-Caramel Chocolate Pecan Pie. 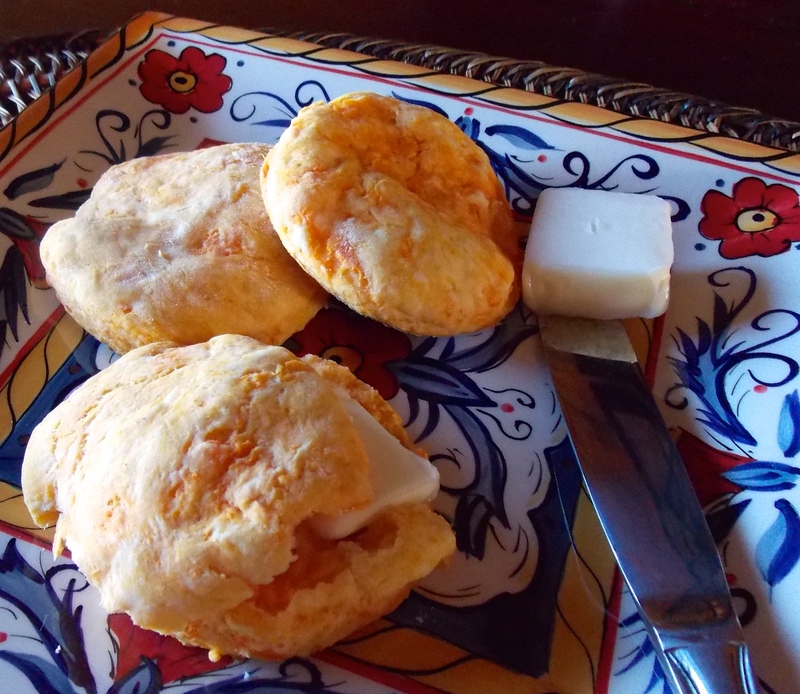 We have a family tradition of starting our Thanksgiving and Christmas mornings with a humble little breakfast: Sweet Potato Biscuits: Family History, Love on a Plate. 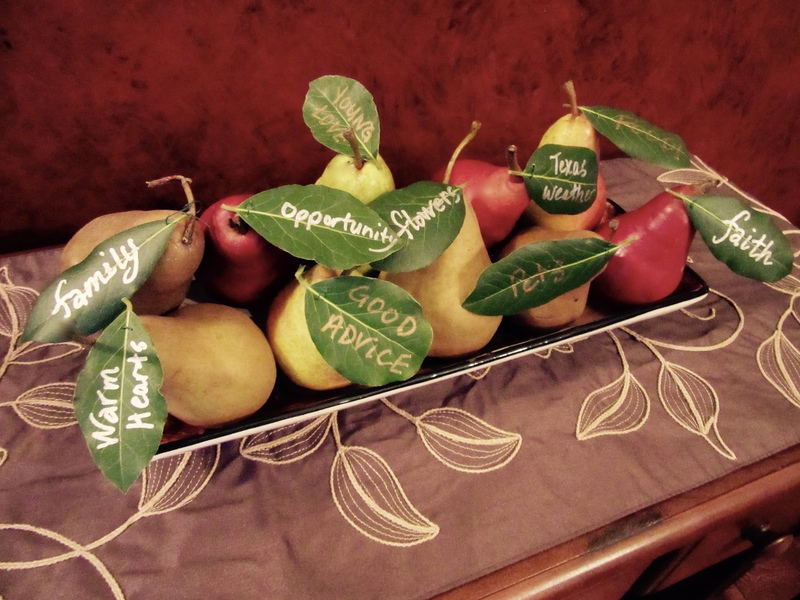 A co-created centerpiece brings the family together in a meaningful discussion of what we’re thankful for; see how easy and fun it is at Thankful for…Bay Leaves and Family . There’s more to share from our Thanksgiving repertoire, but those recipes aren’t documented yet. Maybe next year!